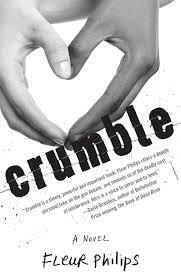 I read and loved Fleur Philips' first book, so I was eager to read Crumble to see if she was going to become one of my favorite new authors...and she has! Fleur excels at weaving a story so gripping and thought-provoking, you'll find yourself staying up all night to read it from cover to cover in one sitting (which I did!). In Crumble, the author combines the topics of racism and bullying in a current-day story that takes place in a small town in Montana. Sarah and David are both eighteen and in love, with plans to move to California in a few months to attend university together. In addition to David, the other special man in Sarah's life is her dad. George is a single father who owns the local gun shop and who lives his life solely to keep Sarah safe and happy. The problem? Sarah and David have been forced to keep their love a secret because Sarah is white, David is black and Sarah's father is racist. In fact, the majority of the town would not accept their inter-racial relationship, even in today's times, so Sarah and David have kept it hidden from everyone except their closest friends. If that's not enough, another problem arises that they must keep a secret, because if discovered, it would most likely be the end of Sarah's relationship with her father---who it turns out, has secrets of his own. I found myself feeling shocked that racism to this degree could still exist in today's times! I felt a little naive as I turned the pages, reading about the way George felt about people simply because of their skin color! What could be so threatening to cause so much hatred? As the story evolves, you come to learn why George has these feelings, but its still impossible for me to relate and understand how someone could be racist. Li'l ol' me kept thinking, "Love is love! Who cares?". Overall, I found this short and fast-paced story riveting and couldn't turn the pages fast enough. The only thing I was disappointed in was the ending, which to me ended too abruptly--or maybe it was just that I didn't like the surprise ending (I won't say any more than that!!). Either way, great story and I highly recommend it! Thanks to BookSparks PR for the book in exchange for an honest review. Kim Walker is a wife and stay-at-home mother of two children who both have autism and her son also has a rare seizure disorder called Dravet Syndrome. Kim and her family reside in Calgary, Alberta, Canada, and when she manages to find some time for herself, you can bet she has her nose buried in a book. If you'd like to talk about books with Kim, you can find her on Facebook.